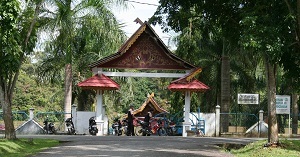 Entrance to Tanggo Rajo in the City of Muara Tebo. Jambi’s history, though mostly built upon myths and legends, has one story about the kings that would sit on the bank of the Batanghari River in the evenings to enjoy the sunset. The City of Jambi has built this story into possibly the most prominent “hang-out” location in their city (Tanggo Rajo, also called ANCOL).